For the first time in a long, long time the New York Yankees have a very strong and an extremely deep farm system. As a self-professed prospect humper, trademark pending, nothing more makes me excited than to watch players like Aaron Judge and Gary Sanchez get drafted or signed before working their way to the Major Leagues and succeeding. Now that this crop of Yankees Baby Bombers are up and dominating the league at a high level it’s time to focus on the next wave of Baby Bombers. 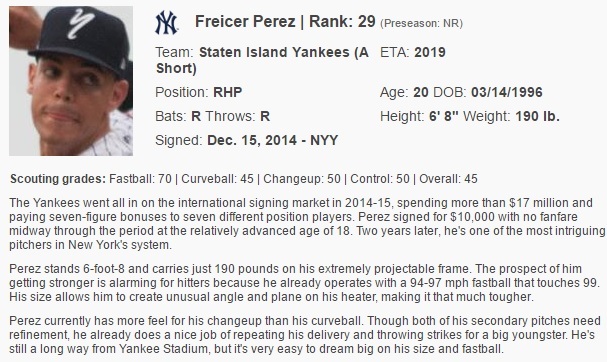 Now normally I focus on players in Double-A or Triple-A but I am going to dive deep into the Yankees farm system for this one and give you another Baby Bomber to watch, Freicer Perez. With the trade of James Kaprielian and with what could be the imminent promotion of Chance Adams the Yankees will need a new wave of reinforcements on the pitching side of things. Justus Sheffield is great, Domingo Acevedo can throw 103 MPH fastballs, Albert Abreu, Dillon Tate and Jorge Guzman look to have found and harnessed their potential but what about Freicer Perez? Truth be told Perez may be the best of the bunch when the dust settles and all is said and done and that is a scary, scary thought for opposing batters in the league. Perez was signed for a mere $10,000 back in 2014, you know… the year the Yankees spent $17 million on international free agents, and has far exceeded any expectations that anyone inside the organization could have given him. Perez started in the Dominican Summer League and was quickly moved up to the New York-Penn League with the Staten Island Yankees in 2016 and in both stops has dominated minor league hitting. 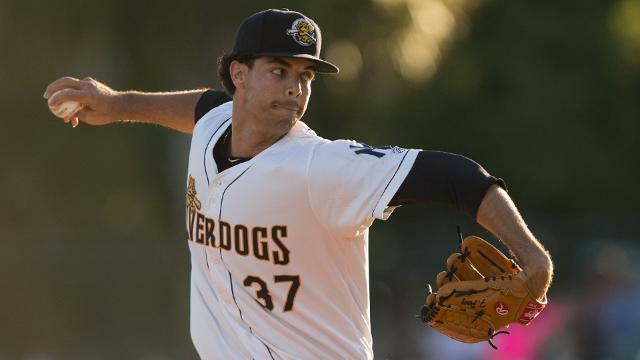 Perez, still a teenager mind-you, has his flaws and his biggest issue is that he gives up a lot of hits, almost one hit per inning pitched in both 2015 and 2016 to be exact, but the right-hander has thoroughly improved in 2017 while with the Low-A Charleston Riverdogs. While Perez still gives up a lot of hits, he has given up 91 hits in his first 112.2 innings pitched this season, you can see an improvement in his 22 starts. Perez has learned how to repeat his delivery and mix his pitches very well and has become more of a pitcher here in 2017 and less of a hard thrower. At the time of this writing Perez was sporting a 2.88 ERA, a WHIP of 1.15, a batting average against of .220 and a staggering 107:39 strikeout-to-walk ratio. Perez throws a fastball, curveball, changeup and a slider and all four pitches have seen upticks in velocity the older the right-hander has gotten. Perez can already reach triple digits on his fastball which has garnered comparisons to another Yankees prospect and All-Star, Dellin Betances. Imagine if Dellin had been able to figure it out as a starter. Imagine that strikeout potential and power as a starter instead of for 100 innings a season in the bullpen. That’s what the Yankees could be getting with Perez if he develops the way every scout thinks that he will. Perez has better command and a better feel for pitching and for his pitches at Betances’ age though which leads many scouts to believe that Perez will stick as a starting pitcher, which is exciting. Perez is just 21-years old and has not pitched above A-Ball in his career so an aggressive ETA for the right-hander is the 2019 season in my opinion, which is okay. Perez could conceivably start next season in Double-A and end up in Triple-A by the end of the 2018 season if all goes well. It may come sooner, the Yankees have shown an ability and a willingness to be aggressive with starters when they have to. See Luis Severino. This time next year though Perez may be the Yankees top pitching prospect in the system, or the best prospect period. His upside is that high and his talent is that immense. Imagine a rotation with Luis Severino, Chance Adams, a healthy Masahiro Tanaka, Sonny Gray and a pitcher who could be dominant like Dellin Betances over the course of six-or-seven innings at a time. That’s scary and borderline unfair. No, that’s greedy and I absolutely love it.